Little Brother took me back to my childhood. Not necessarily because the main characters are teens, but because it sucked me in and dominated all else until I finished it. These days I rarely have the time to just sit and spend a day reading. This book didn’t give me the option, once I started it I had to finish. No book had done that to me since I was a teen. 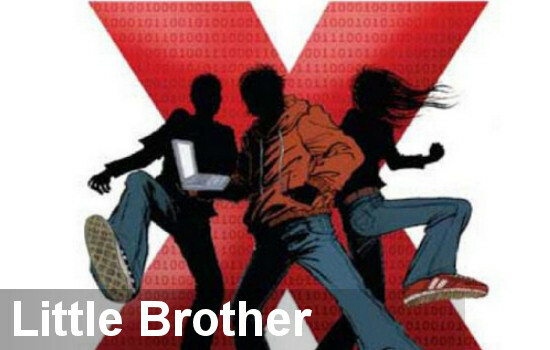 Cory Doctorow’s tale pits a teen hacker and his friends against a run-amok Department of Homeland Security. Following a terrorist attack on San Francisco, the protagonist Marcus finds himself under suspicion and surveillance by the DHS. Marcus, his friends and his family must all come to terms on whether they will accept the new status quo, or fight against it. I don’t want to delve much further into the plot, lest I ruin anything. While aimed at a teen audience, this is not a light hearted adventure romp. Doctorow tackles serious, and frightening, topics that hit quite close to home. For all its seriousness though, he also manages to make it fun and engaging. It has rightly been compared again and again to Orwell’s classic 1984. Doctorow has spoken about how today’s children are the most watched kids in history. The real big brothers are kids’ parents, their schools and their favorite hangouts. Video surveillance surrounds them. Software trackers follow them online. Guards and metal detectors search them at school. Their cell phones come with built in GPS trackers. Little Brother questions the role, and the outcome, of such security and surveillance in our kids’ lives. Besides being a wonderful story, Doctorow also weaves real lessons on computer science and security through the novel. His plain language description of encryption is one of the best I’ve ever seen. Marcus has an almost MacGyver like ability to beat security systems with homemade devices, except that the tools and techniques described actually work in real life. Teen and adult alike will take away valuable insight into the nature of our increasingly secured world, and learn better how and why that security ought to be questioned and challenged. You may be wondering why Co-Optimus is covering a book. First, Little Brother is about cooperation, even if it isn’t directly about the video game co-op that we all know and love. The novel opens with a group of kids tackling an ARG together, and moves through LARPing, consoles and MMOs before it’s done. It even speculates on the next version of the Xbox, which plays a rather important role in the story. Second, it’s the only novel I’ve read where gaming is simply a natural part of the world, with no need to justify or explain its inclusion. It’s refreshing to see games and gamers portrayed in a positive light. This is a book written for gamers, particularly those who love playing with others. Little Brother should be available at your favorite bookseller (Amazon $12). But if you like free things, you can also download it from Doctorow’s site craphound.com. He releases most of his content digitally under a Creative Commons license. Besides writing fiction, Doctorow also co-edits boingboing.net and his articles and essays can be found in a variety of publications.